Bitcoin and Euro betting. Payments options: Bitcoin, debit/credit cards or banks. Watch free Live Streams of dozens of sports, including Spanish & Italian soccer. 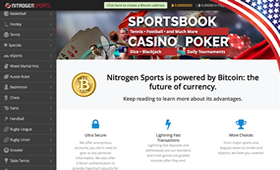 This cryptocurrency based sports booking site was founded in 2016 under the umbrella of a large coin gaming operation. They are licensed in Curacao, and they offer users the ability to place their bets anonymously using Bitcoin. However, some users have found that if they try to make a large withdrawal then they very well may be subject to KYC verification, and that could be a problem since the site does not officially allow United States users. They do however over an expansive selection of sports and matches which their users can take advantage of. The site itself is well designed and easy to understand. The homepage quickly directs you to the different events that are going on, and it allows you to easily choose from a large number of sports and matches. If you sign in, then there will be some very convenient links which will allow you to watch the progression of your matches in real time which is nice. 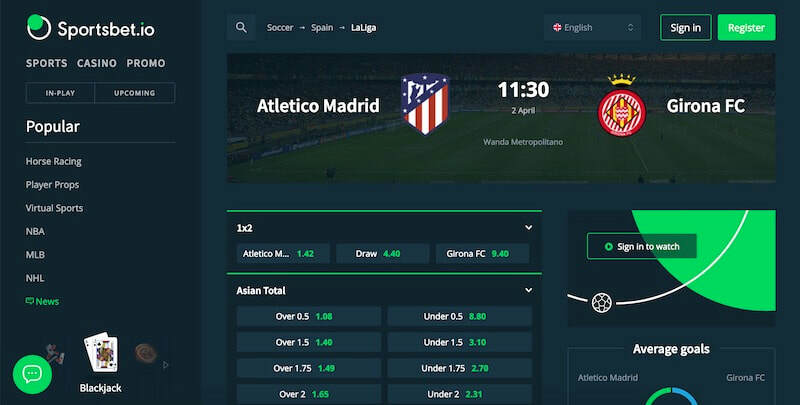 The minimum bet for this platform is also quite low, allowing users to test the waters without losing their shirt. The platform works hard to make sure that your money stays secure by offering numerous security features. This includes 2 factor verification, which you should definitely use. Cryptocurrency is an entirely different animal than using your bank card, and a platform provider that puts security first is something you should be looking out for. They also offer some awesome features which are a first in the world of cryptocurrency gambling. For starters, they have a cash out feature. What this does is that it allows you to cash out a bet without waiting for it to finish. This allows you to take your winnings early in order to take advantage of something you fear might take a turn for the worst. If you've got a good amount of money riding on a game, then you could opt to take a partial profit for safety reasons using this unique feature. They also offer the ability for people to place bets through telegram. If you're not aware of it yet, this is a popular messaging application for mobile phones. 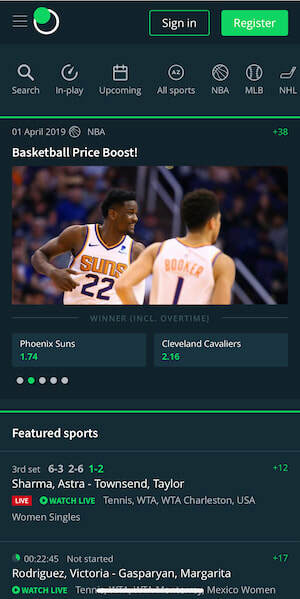 This feature allows for users to easily place their bets on the go through the chat bot. This could be useful if you're out and about or even if you just have poor access to reliable or cheap data and need something with less impact. The bot can function in multiple languages as well, possibly allowing better usability for many people. Live streaming is also available on dozens of sports for anyone with an active account. You can watch Italian, German, and Spanish soccer, rugby, major tennis tournaments and many other sports for free. 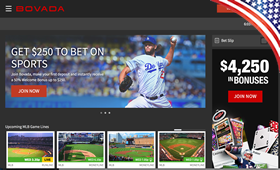 Most bitcoin sportsbooks do not offer live streaming. Upon choosing a sport and a match you'll be presented with many different options. You can throw your money into several different pools of odds and handicaps which will give differing payouts. If you're unfamiliar with the one of the teams in your match up you might also be interested in taking advantage of the nice little statistics screen that is provided. This will offer you a variety of information which will help you to estimate what the odds are of one team being victorious over another. USA visitors to the site will be greeted with a menacing pop up which tells them their business is not allowed. However, this seems to end their caring about you being on the site. Since the website does not actually require verification you may be tempted to make an account anyway, but you should know that this may not always be the case. Deep down in the terms of service the site owners reserve the right to request verification from you at any time. For many users this is right when they decided to withdraw a substantial amount of winnings. You should be able to see how this could create a problem for US users who are trying to skirt the rules. If you do plan to try doing this, be careful, and try to withdraw smaller amounts. 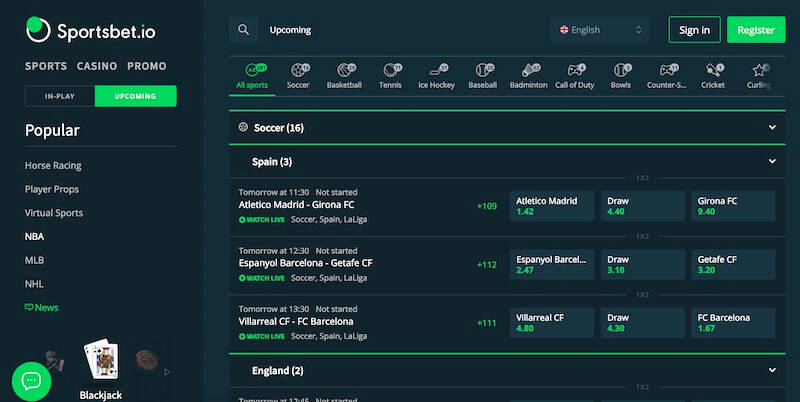 Sportsbet.io offers limited support options, but they do have a 24/7 live chat which you can use to help rectify your issues. They also have an extensive FAQ which can answer the most common questions about both their site and cryptocurrency in general if you are new to it. Like many gambling platforms, Sportsbet offers a promotion to help those on the fence to make the plunge. You can earn 3 times your initial bet by placing a bet on any sport. However, the exact amounts are very specific, and you'll need to follow the instructions carefully to earn your bonus. The amount earned is actually pretty small, but it's free money. If done correctly you'll be rewarded with a free 0.09 ETH bet within 48 hours. You can also benefit from enhanced betting odds by taking advantage of their daily "Price Boost". 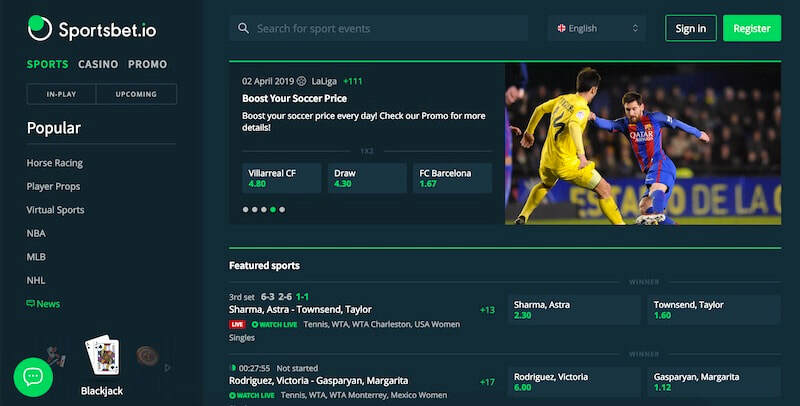 Overall, Sportsbet.io offers a wide variety of betting options for those looking to get into cryptocurrency gambling. The website is easy to use, and they provide a lot of useful and unique options when compared to some other sites. They do unfortunately have a few "gotchas" to look out for such as their hidden verification requirements and the exactness of their promotional bonuses though. They do however have a fast support system and excellent resources for beginners. 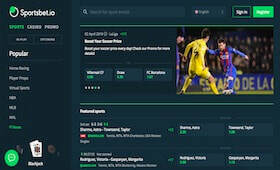 They also offer free live streams of major sports, cash-out and you get a daily price boost on any sports you choose.